Minutes after being defeated by the Memphis Grizzlies in the first round of the NBA Playoffs, a gaggle of reporters swarmed LaMarcus Aldridge’s locker for clues as to where the big man would play out his next season. As has been the case throughout the year, Aldridge was noncommittal in fielding questions, which only fueled further speculation. Numerous analysts went on to take Aldridge’s refusal to commit as evidence that he has already played his last game in Portland. To date, five teams have been mentioned repeatedly as ideal landing places for an All Star forward chasing championship dreams. New York and Los Angeles will always be mentioned in any free agent sweepstakes, as big-time players certainly revel in the possibilities of performing beneath the bright lights of the two largest media markets in America. Both franchises, however, have fallen upon hard times in terms of devastating injuries, losing records, and historic front-office dysfunction that has signed aging stars Kobe Bryant and Carmelo Anthony to mega-deals, while also giving away future draft picks. Still, New York has just enough to edge Los Angeles as a dark horse candidate to sign Aldridge this summer. Certainly, prospective free agents have taken note of Dwight Howard and Pau Gasol flourishing in Houston and Chicago, far away from the glare of a cantankerous Bryant. Alternatively, Jeremy Lin was promptly ridden and buried at the end of the L.A. bench after taking New York and the league by storm in 2012. Phil Jackson and Derek Fisher, of course, have committed themselves to the lengthy and trying process of installing the triangle offense, a system that sets up open midrange shots through solid picks, sharp cuts, and crisp ball movement. The triangle offense works best with skilled big men who can operate from the elbow area as willing passers and consistent midrange jump shooters. Sound familiar? The Mavericks are often cited as frontrunners for the grand prize in this year’s free agent sweepstakes, as Aldridge was born and raised in Dallas before heading down I-35 to play his college ball at the University of Texas. This year, the Mavs closed out the regular season at 50-32 before going down 4-1 to the Houston Rockets in the first round of the playoffs. The Mavericks have a number of assets that may be dealt in exchange for cheaper role players to free up cap space for Aldridge. Rajon Rondo, of course, is already all but gone after the midseason move to acquire the headstrong guard proved disastrous. 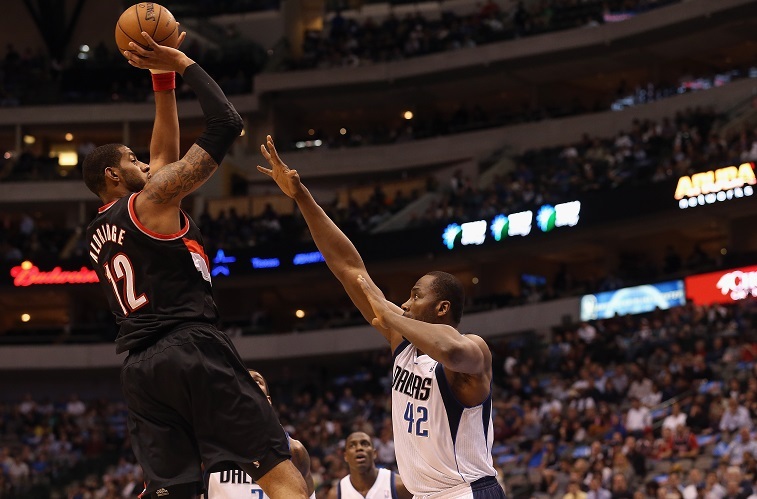 A LaMarcus Aldridge move to Dallas, however, would force a logjam at power forward for the Mavericks. For 2014-2015, Dirk Nowitzki put up 17 points and six rebounds per game, while Aldridge went for 23 and 10. Both players are more comfortable at the 4 than at the center position, and while Dirk is willing to come off the bench, head coach Rick Carlisle would be forced to balance minutes between his two best players. Worth noting: The Mavs have signed former Trail Blazer Wesley Matthews. The idea of Aldridge simply staying put in Portland has been largely lost in the shuffle of the latest free agent mania, and while it looks like a lost cause, it’s worth evaluating if only to remember the good times. In 2006, the Blazers made a draft day trade with the Chicago Bulls to acquire LMA as a first step in restoring the organization’s image from the infamous “Jail Blazer” era. 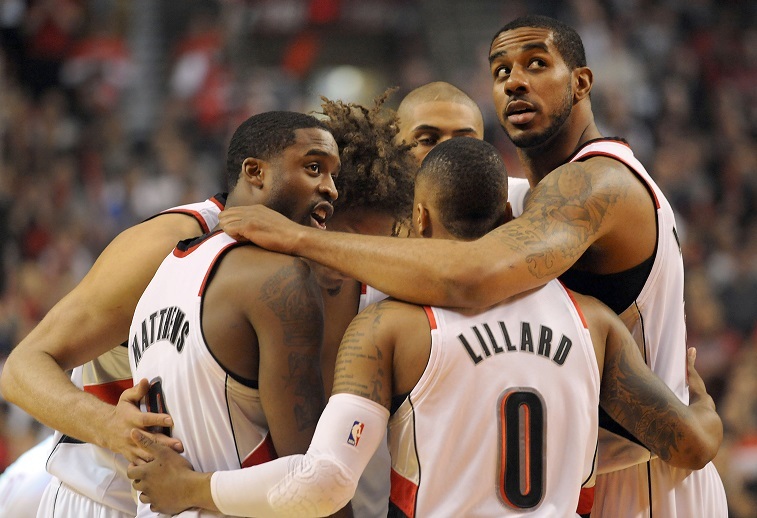 The new-look Blazers quickly emerged as a popular bunch notable for their cohesiveness and team play. A Portland Big Three featuring Aldridge, Damian Lillard, and Wesley Matthews accounted for 60.3 points, 18.5 rebounds, and 10.2 assists through the 2014-2015 regular season. Emotional leader Wesley Matthews, however, missed the 2015 playoffs with a devastating knee injury. The gritty Memphis Grizzlies took out Portland in five games, while Matthews and his tenacious defense and outside marksmanship watched the action from the bench in street clothes. Next year, a healthy and more mature Blazers roster, with Aldridge in the fold, may emerge as one of the teams to beat in the West. Also of note: Portland can offer Aldridge the most financial security. 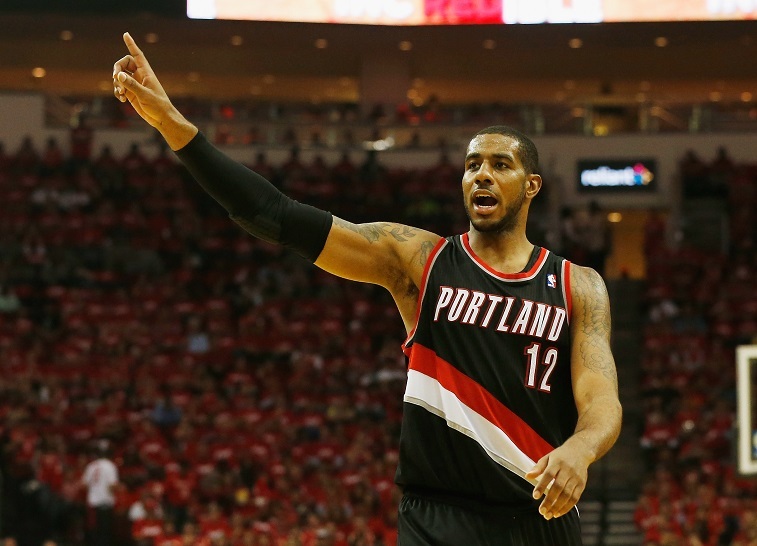 As his home team, Portland could offer Aldridge a five-year deal that pays out $100 million-plus. Other teams, however, are limited to offering Aldridge a four-year deal at maximum money beneath the terms of current collective bargaining agreement. The Houston Rockets lost Chandler Parsons prior to the 2014-2015 season, when the versatile forward signed an offer sheet with in-state rival Dallas. From there, Houston scrambled to make a play for Chris Bosh, only to watch him return to Miami. Bosh would have been somewhat of a consolation prize for Houston after team executives botched an attempt to sign Carmelo Anthony that inadvertently resulted in alienating Jeremy Lin. 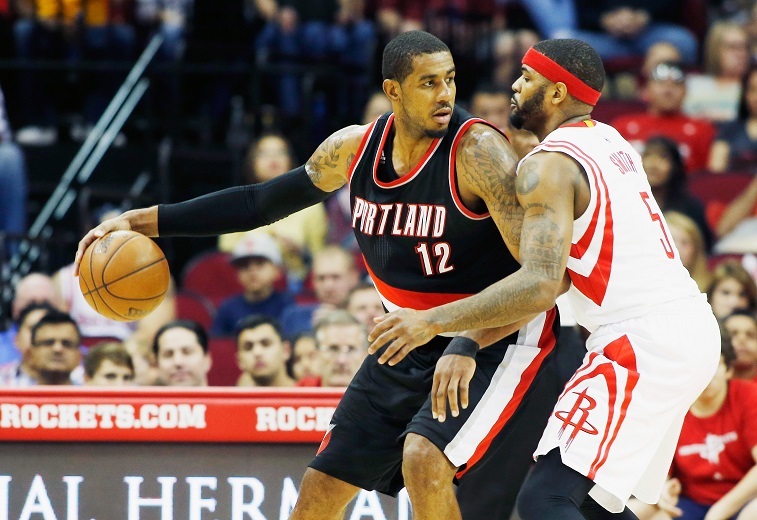 The recent free agent bungling in Houston has cleared the way for Aldridge to sign with the Rockets this summer. For now, James Harden and a healthy Dwight Howard are a devastating inside-out combination, and adding Alderidge to that mix would create a Big Three that would be unrivaled in the league today, particularly with the threat of Aldridge playing off the ball in a Howard-Harden pick and roll. One big wrinkle to this vision, though, is whether LaMarcus is willing to subjugate his own game as the third wheel behind Houston’s other two superstars. In 1999, a young Tim Duncan teamed up with David Robinson as part of a twin towers lineup to claim the first title in San Antonio franchise history. Tony Parker and Manu Ginobili first took the floor with Duncan in 2002. The Duncan-Parker-Ginobili trio went on to win four championships together, in 2003, 2005, 2007, and 2014, one of the most enduring dynasties in NBA history. This season, the Spurs went down in 7 games in an epic first-round series against the high-flying Los Angeles Clippers. Almost on cue, sports analysts began to claim this playoff loss signified the final run for Duncan, 39; Ginobili, 37; and Parker, 32, as a group. 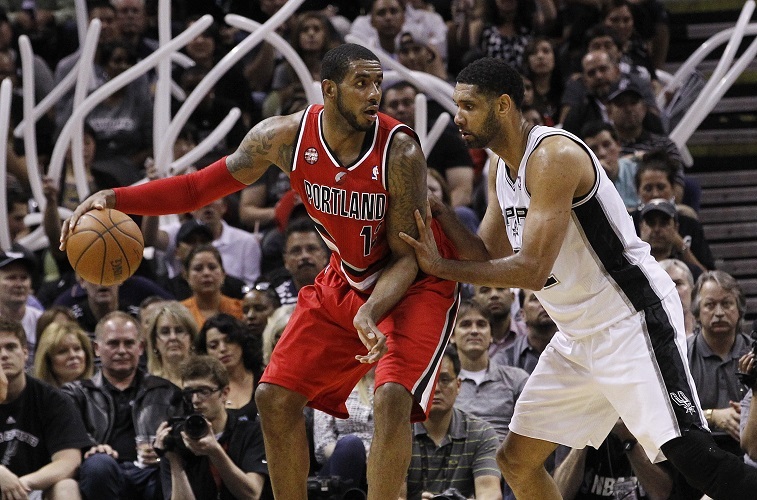 Singing Aldridge would open up yet another window for a potential Spurs dynasty. Next season, Duncan, Ginobili, and Parker would finish passing the torch to Aldridge and Kawhi Leonard before finally riding off into the sunset. As a skilled forward, Aldridge’s game would appear tailor-made for the complex San Antonio motion offense and could usher in the next era of Spurs basketball.